It has has been a busy year for Night Stations. First off was Meander which sought to re-draw the path of the Derwent in the Hope Valley as it might have been in the past. This was followed by Sywell Echo while Seeing the Light, an exploration of Brocken Spectres, is just concluding. keep informed - exhibition soon! Sywell Echo Complete! 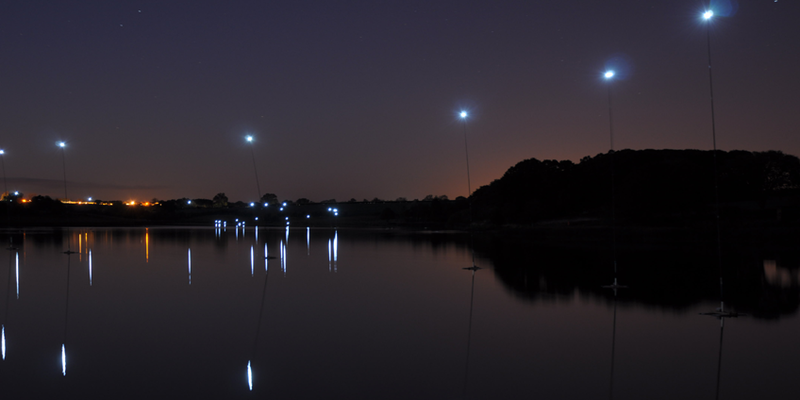 Nearly 100 LEDs trace the old river system hidden below the Sywell Reservoir. Each LED hovers above the reservoir exactly the height that the rivers lie below so that, on a calm evening, the old river system is precisely drawn by the reflection of the LEDs in the water. I'm just concluding my residency at Bend in the River's X Church in Gainsborough where I'm exploring Brocken Spectres. These optical phenomena, originally seen in mountains, comprise a shadow of the viewer cast against mist surrounded by an iridescent glory. View here some of the first experiments.